Nowadays, email marketers understand that personalization is a tactic which cannot be ignored in the case of email capture. Each and every customer’s differences go beyond even demographics. Gone are the days when generic mails were used. Now the myth of one-size-fits-all messaging has gone wrong. Every modern marketer is striving to leverage personalization in emails which are custom made for the individual. They are highly relevant and tailor-made material. They design an email as there will be more chances of getting opened and clicked on. When you send the right content to the right customer, you can strengthen the customer experiences. I am not making inconsistent statements here. Honestly, email personalization has helped various brands to see higher engagements and conversions time and again. Why emails continue to work better than other marketing channels? Gone are the days of one-size fits all messaging, now the customers are send personalized messages to meet their expectations. Personalization is the process of targeting an email campaign to a specific subscriber. You can leverage the data and information of a customer and utilize it to targeting an email campaign- Using the name of a subscriber in the subject line or changing the content of the email based on a subscriber’s gender, location or other relevant factors. The basic personalization tactics that add value to your customer’s experiences in a big way are by changing the name, and the subject line. From sophisticated personalization to low-level personalization, there are many personalization tactics which do wonders. For a lead nurturing process, a drip campaign works well. A drip campaign is a method to acquire customers through lead nurturing. In this process, you need to send information to nurture prospects through the marketing funnel. It is a slow process which gently nudges the prospect to take action. The drip campaigns can work better if it is personalized according to the interests of the customer. There are different kinds of personalized drip campaigns such as educational, re-engagement, transactional, behavior-based drip campaigns. Personalized Drip Campaigns such as Educational and awareness drip campaigns are solely targeted towards educating and creating brand awareness. Gradually as you start engaging, your email content narrows down as per the customer’s interests. As the time passes slowly, you can start sending customers emails related to upgrade their branding. Personalization paves the way to targeted and relevant content to your customers and prospects. It adds value to their experience in the buyer’s journey. It drives increased ROI and revenue for growing business. How are drip emails increasing engagement? Can you gain successful results out of email marketing strategy without engagement? It’s like sugar-less tea. Drip email marketing is meaningless if you are not able to get your subscribers to open and click on your emails. For instance, let’s talk about a welcome drip, a common type of drip email campaigns every business practices. At EasySendy Drip, we tested a small drip sequence for our subscribers immediately after they opened our welcome email. For this sequence to work, it was mandatory for our subscribers to open our welcome email first. Only then, this flow would get triggered. Subscriber nurturing requires a personal touch so as to make more conversions. Hence, it is necessary to keep your subscribers happy by gently pushing them through the buyer’s journey and creating conversions. Once you have received customer’s information, you can send them highly personalised marketing messages which are triggered based on their engagement and website behaviour. Email drip marketing helps your business to build trust and nurture the relationship with their prospects. Effective email drip- marketing can be easily customised and personalised in limitless ways to meet your organization’s requirements. There are different kinds of drip campaigns such as educational drip campaigns , nurturing drip campaigns , welcome drip campaigns, promotional and a lot more. Do you think is it possible to capture a lead by politely asking your visitors? Yes, ofcourse it is possible if it doesn’t disturb them and look like a barrier to them. As you know building an email list is an excellent asset for your company. Henceforth you must start asking your customers for emails at the end of your content. How many of you decide to buy a product after checking it all-through? Yes, everyone does take time to review its features and buy it. The same principle applies to the website visitors also as most of the visitors decide to subscribe after reading the whole content. 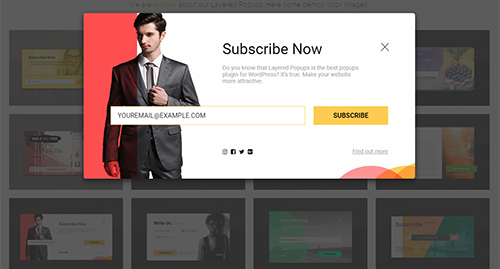 You can trigger a popup to subscribe by the time a visitor reaches the end of the content. Now it’s the right time to convert well, and in some cases, it may convert other users too who were unwilling to subscribe at the beginning. The opt-in forms are the legal way of sending bulk emails. You may have seen Opt-in forms, and you probably would have asked what is its advantage? The answer is email subscribers. When a first -time visitor visits your website, you have converted a stranger into a visitor. Once when the visitor starts browsing through your webpages, you show them a subscribe-popup. At EasySendy Drip, we use our amazing popup templates to capture email leads. We include social subscribe buttons to speed up our conversion process. Also, since all our email subscribers are automatically added to our contact database once they submit the form and segmented based on behaviour, it is easy for us to initiate nurturing drips. Incase, they don’t like what they see, we initiate the exit intent popup for a last attempt. We recently offered a free copy of our eBook full of email marketing resources which increased our conversion rates by 2.7% in 30-days’ time. Using popup forms to capture email subscribers is one of the most ideal ways to grow your email lists. Another reason why popups work is: You can build an email list that has the consent of your subscribers. In this post-GDPR era, it is mandatory that you use double-opt-ins so that all your marketing activities are consent-based. At EasySendy Drip, we take user privacy very seriously and do not support third party email lists under any circumstances. Facebook has more than 1.23 billion daily active users, which makes it a prime location for marketers to attract customers. It is a hub for marketers to generate subscribers through paid promotions as well as organic marketing. By asking visitors to submit a pre-filled form, these ads enable marketers to show only relevant ads. When an advertiser sets an ad through Facebook’s ad manager, he/she targets a niche audience by customizing the target features, budget or other assets. When Facebook starts showing these ads to potential customers, it gets displayed in a target user’s news feed. The best part is that it looks like an organic Facebook post but is designated as sponsored. For example, building email lists for your blog can be done using a simple Facebook ad, something that WoodWorkers Guild of America has done so neatly. Once the marketer receives the email id or any other details of the user, he/she can nurture them by sending properly planned email drips – welcome drips, followed by onboarding drips, and then educational series (all depending upon the user engagement and behavioral patterns). The best part of Facebook lead ads is that they are device compatible, which means you can capture your email subscribers across all devices at any given time. Lead Magnet equals a bone dangled in front of a hungry dog. The lead magnets are just cannot be missed by any marketer as they want it badly and it doesn’t cost any money. Only an email can make them part of their distribution list. Have a look at some of the content related lead capture tools which can be easily used to grow your email list. #1. Videos are the most effective tools. The takers for a motion graphics is always higher than a static text or image. Looking at the rate at which short video ads are popping up on our social media news feed, it is obvious that videos are generating more conversions than any other ad format. It is amazing how videos are getting viral in no-time, and engagement rates are rocketing north-wards in a snap. If you need to make your presence felt, try Facebook videos. Infact, Instagram is another social media platform that is taking video marketing to another level. For instance, take a look at this amazing (and mouth-watering) video treat from Ben and Jerrys. teaching you to make Halloween treats, now that its already time. You can already see the number of likes this video got in a span of just one day. There's more than one way to enjoy Halloween candy. Get the full recipe at the link in our bio! For example, if you are a blogger and want to make first-time visitors sign up, you must send them a case study entitled,” How to write the best captivating topic for your blogs.” It will feel appealing to bloggers who want to write favorite topics for their blogs. Hence the blogger gets the email, after which it can be gradually nurtured and converted into a customer. #3. Webinar invites can also work to boost branding? Ofcourse webinar is a great way to do branding. You can use your popups to inform or announce about an upcoming webinar and place a offer code for early bird registrants. Many of you would have gone through the call-to-action similar to “Only 24 secs left to claim,” which shows a limited resource. Such urgency in your popup forms can trigger quicker conversions, because no one wants to miss out on good things. That’s a great article, Sreeju. Hope to learn more from your future insightful articles! I like this guide so much! The section on personalization is very insightful, and I think it is necessary in increasing engagements.